“I am.” She deposited the key down the front of her dress. “But I’m kinda getting the hang of this adventure thing.” A grin tugged at the corner of his mouth, but he suppressed it. She was charming, no doubt about that. And damn mysterious, too. As she stood there smiling with cat-like satisfaction, he had to resist the urge to take her in his arms and kiss her. Just the idea of pressing his lips to hers was making him hard. The trouble was Laura had no idea what she was up against. She thought of all this as an exciting change from her ordinary life. But this was real life, and real life was full of people whose sole purpose was to inflict as much pain as they possibly could. It was all too easy to go about one’s business without ever seeing the dark side of things—he’d done it for years, and in a way, he wished he could go back to being that twenty-year-old kid who signed up for an interview with the FBI mostly to impress his buddies. But after more than a decade spent hunting killers he knew that like all fairy-tales, the happily-ever-after of suburbia had its monsters. I live in an old Cape house with my daughter, too many books, and a red-and-white Siberian husky born on Halloween. After working in Washington, D.C. for several years and traveling to Russia, Europe and Pakistan, I moved back to New England. I’m the author of the romantic suspense novel Vertigo, which is available as an E-book from Amazon Encore and in paperback from Wild Rose Press. 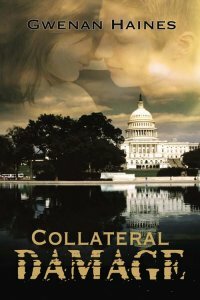 Collateral Risk, the follow-up novel to Collateral Damage (which features Dalton’s boss Nick Doyle and scientist Mia Lindgren), is forthcoming from Wild Rose Press. When I’m not working on fiction, I write poetry, teach literature and am still trying to learn how to cook.